Is it Utopia or Reality? The purpose of this article is to examine the current and rapidly developing trends in the Middle East, and attempt to project likely scenarios in the near to middle-term future. Only time will tell if what we are projecting as possible is a utopia, or will in fact become reality. In June 2009, then U.S. President Barack Hussein Obama went to Cairo and delivered a speech at Cairo University. It was co-hosted by Al-Azhar University, the preeminent theological seminary in the Islamic world. Observing this speech from the front rows – specifically requested by Obama – were members of the Muslim Brotherhood, the umbrella organization of Islamic terror, from which groups like Al Qaeda, the Abu Sayaff Group, and ISIS are ultimately derived. This speech, entitled “A New Beginning,” was the thematic basis for the Obama presidency. Ultimately, the administration would back the Muslim Brotherhood (and other, aligned terrorists groups) in the so-called Arab Spring to overthrow the existing governments in Tunisia, Egypt, and Libya (while ignoring a genuine uprising in 2009 in Iran, see here). Syria and Jordan were also targets of these Arab Spring uprisings. Fast-forward to 2015, and the Obama administration had completed what they consider their crowning foreign policy achievement: a “nuclear deal” with Iran, that the administration claimed would prevent Iran from acquiring nuclear weapons and the requisite rocket technology to deliver the warheads. In praxis, however, the deal legitimized Iran internationally, increased their regional prestige, and emboldened their territorial ambitions – see Syria, Iraq, and Yemen. The net-net result of Obama’s backing of the terrorist Muslim Brotherhood and the terrorist regime in Tehran was a reckoning between several regional powers who had, and have, an interest in containing Iranian influence. In particular, Egypt, Israel, and Saudi Arabia – notably, all historically American allies – are coordinating and acting to check the expansion of Iranian power while simultaneously attempting to contain the spread of terrorism, which routinely reaches the shores of Europe and America. Moreover, the struggle today largely breaks down into a Sunni (led by Egypt and Saudi Arabia) vs. Shiite (led by Iran) confrontation. Probably the most visible and promising changes to the region are happening in Saudi Arabia, under the rule of its young and reform-minded Prince, Mohammed bin Sultan (aka “MBS”). Saudi Arabia and Israel regularly and routinely share intelligence on their mutual enemy, Iran. This level of cooperation between Saudi Arabia and Israel is truly revolutionary, to say the least, for the region. Last week, Israel and Saudi Arabia co-sponsored a resolution in, yes, the United Nations condemning the human rights abuses in Iran and Syria. The Chief of Staff of Israel’s IDF granted an unprecedented interview to a Saudi newspaper, identifying Iran as the region’s chief troublemaker, and declaring officially the willingness of Israel to share intelligence. In a truly stunning development on Friday, Saudi Arabia publicly announced they would compensate Israel $1 billion plus to strike Hezbollah as quickly as possible in southern Lebanon. This follows the departure of Lebanon’s Prime Minister, Saad Hariri, for his native Saudi Arabia. In the meantime, he flew with his family to Paris, France on the invitation of President Macron. Prime Minister Benyamin Netanyahu undoubtedly recognizes the historical import of the moment, as the Arab world, led by Saudi Arabia, seems likely to reach a lasting peace with the Jewish state. The opportunity also presents a unique chance to finally settle the Palestinian problem in Judea and Sumaria (i.e., West Bank). Sandwiched between Hezbollah in the north (in Lebanon) and Hamas to the south (in Gaza), Israel is working with its Arab allies to root out the terrorists on its borders (see proposed Saudi action above). Since assuming the Presidency in Egypt, el-Sisi has been coordinating intelligence and military operations with Israel in the Sinai Peninsula. Egypt is expected to take the lead in “cleaning” out Hamas (i.e., the Muslim Brotherhood) from Gaza. The political fate of Judea and Sumaria remain the most significant obstacle to long-term peace between Israel and the Arab States. Recent Saudi-led initiatives signal an eagerness to finally settle this challenge. Polling suggests that a majority of Israeli Arabs do not want to live in a Palestinian state. A potential solution could take this form: recognition of a Palestinian federation in Judea and Samaria and localized rule for the Arabs, with input and assistance from Jordan. On the other hand, the IDF would be responsible for security in the Jordan Valley. Resolution of this issue could realistically enable normal diplomatic relations between Israel and the Gulf States, ending nearly 70 years of political turmoil and unpredictability. As president of the most populous Arab country, el-Sisi has led the calls for reform of Islam since his coming into power. Not only did he call out the Imams at Al-Azhar for promoting murder of non-Muslims, but he has remained dedicated to eradicating the Muslim Brotherhood’s influence within Egypt. In conjunction with aggressive military operations against neighboring terrorists, this puts el-Sisi in a serious security dilemma. In neighboring Libya, Egypt leads ongoing airstrikes against Islamist militias including ISIS, which are leftovers from Syria and Iraq. This has the added benefit of stemming the so-called “refugee” flow into southern Europe (Italy and Greece). As mentioned above, Egypt and Israel are cleaning out the northern Sinai, a route through which weapons flow into Gaza. El-Sisi’s hardline stance against the entrenched Muslim Brotherhood, combined with his friendly and cooperative stance with Israel, put him at high risk of assassination. 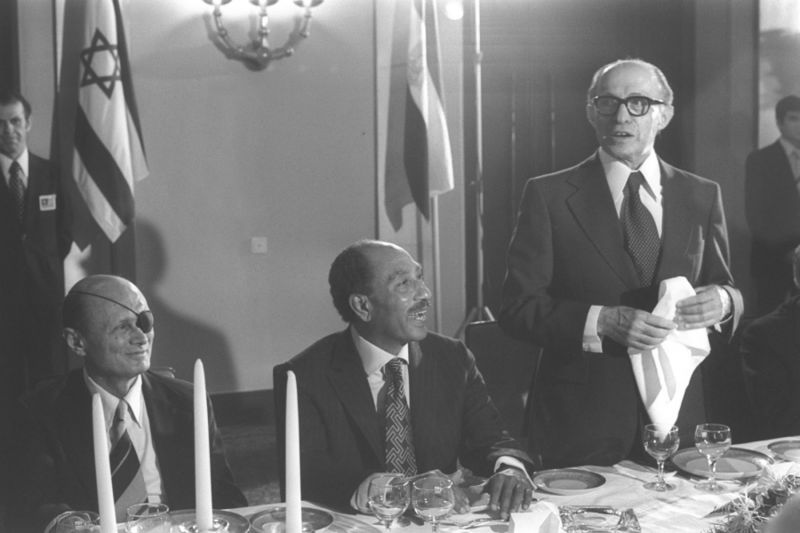 One merely must recall the price that Anwar al-Sadat paid for his visit to Jerusalem and 1979 peace treaty with Israel. The Hashemite Kingdom of Jordan has, for decades, worked with Israeli and western security services. King Abdullah Hussein of Jordan, a western-educated Arab ruler who dresses in a suit, faces an extremely delicate internal political situation. The Muslim Brotherhood, and lately Hamas, are powerfully represented in Jordan’s government, and as such the King’s friendly stance with Israel is muted out of concern for domestic unrest. Palestinians, who are actually Arab Jordanians, have significant political sympathy within Jordan. This, despite the fact that Abdullah’s father, King Hussein, killed thousands of Palestinians aligned with the PLO during the “Black September” operation (1970-71). Security in the West Bank is as much a concern to Jordan as it is to Israel. Therefore, resolution on this issue is very much in the interest of Jordan. With terrorists in his government, King Abdullah faces a challenging personal security situation, similar to President el-Sisi. It is not unlikely that he may be targeted for assassination, like his own great-grandfather Abdullah I.
Yemen, to Saudi Arabia’s south, is in the midst of a civil war/insurrection. The Houthi rebels, located in former North Yemen, are being armed by Iran. Tensions escalated with Riyadh when a second rocket was fired at King Khalid airport from Yemen. Due to their border to the south, the Saudis view Yemen as the primary proxy war with Iran. Does the future of Yemen look like its past? Will Yemen again break into North and South, with Aden as the capital of North Yemen and Saana the capital of South Yemen? This potential outcome is consistent with a broader trend of secession movements across Europe and the Middle East. Bashar al-Assad, with the aid of Russia, remains in control of much of Syria including Damascus, Aleppo, and Homs. The war will enter its seventh year this January, and Assad will likely remain in control. Israel and Egypt are not opposed to Assad’s rule, and the Russian footprint means that the territory under government control will not be surrendered. Assad is an Alawite, an ancient people whose culture predates Islam. Although Tehran’s ambition remains a land route through Iraq and Syria directly to the Mediterranean, Assad clearly wishes to remain independent of Iran. To the North, parts of Syria may eventually be ceded to Kurds for the formation of an independent Kurdistan. Although discussed in foreign policy circles, a new Sunni state within Syria would mean Assad surrendering territory that he currently controls. This scenario remains unlikely under present conditions. With Iran-friendly Shiite rule in Baghdad, it is difficult to consider eastern Iraq an independent country. Iraq is effectively divided into three territories today: a Shiite dominated center east, with Kurds in the North, and Sunnis to the west and south. As ISIS is consistently decimated and systematically cleared from the land, regional powers Iran and Saudi Arabia will continue to vie for influence. The Kurds, who control much of Iraq’s oil, are negotiating their independence with Baghdad, although the likely outcome of these negotiations remains murky. Will Baghdad, under firm Iranian influence, remain in nominal control of all of Iraq’s territory? A status quo of this nature would undoubtedly translate into several insurgencies to disrupt Tehran’s influence. Or is the future of Iraq partition – Shiite dominated Baghdad and east, an independent Kurdistan to the north, and the formation of a Sunni state, that includes part of Syria? The Arab Spring, the rise and fall of ISIS, and a long and distinct history make the formation of an independent Kurdistan more likely than ever. The United States should finally step up in this discussion, and back the creation of an independent Kurdistan. The Kurds have been the absolute fiercest fighters against ISIS. Kurdish Peshmerga have aided in the liberation of key cities, including Mosul and Kirkuk. Many Kurds have given their lives to defeat the most barbaric army in modern times. Their justification for the creation of Kurdistan is therefore very compelling. In pursuit of a Kurdish homeland, the Kurds have the unequivocal backing of Israel. These tiny Gulf States have effectively lined up firmly behind Saudi Prince Mohammed bin Sultan. With the exception of Qatar (see below), they are de facto aligned with Egypt and Israel. Bahrain, with a 70% Shiite population, intends regardless to remain independent of Iran’s (Shiite) influence. The United Arab Emirates previously declared the Muslim Brotherhood a terrorist organization, and remain dedicated to interrupting financial support to terrorist organizations. Although complicated by internal politics like Jordan (see above), in the years since the Arab Spring, powers within Kuwait are firmly encouraging the recognition of Israel. The outlier on the Arabian Peninsula, Qatar, is defiant in the face of sanctions and diplomatic isolation by the Gulf Cooperation Council. Qatar’s network Al Jazeera was instrumental in promoting the Arab Spring, and their insistence on maintaining excellent relations with Iran are unacceptable to their Gulf State neighbors. Qatar and Iran share the massive South Pars/North Dome gas field, in the Persian Gulf. This presents a fundamental reason for Qatar to maintain a friendly relationship with Iran. Qatar has welcomed exile terrorist from Hamas, the Muslim Brotherhood, and the Taliban. To cope with the crippling blockade imposed by Saudi Arabia, Qatar has moved closer to Turkey and now imports food to keep their population from going hungry. Finally, the United States has thus far appeared reluctant to take sides, as the Al-Udeid Air base near Doha is one of the largest American bases outside the continental United States. This obstacle could be easily overcome by upgrading existing U.S. bases either Saudi Arabia or any other willing country in the Middle East. Following World War I (1918) and the collapse of the Ottoman Empire (1924), the borders of the Middle East were redrawn, largely arbitrarily, creating several nations with natural flashpoints among and within themselves. The history of last century in the Middle East is the story of these flashpoints, resulting from religious, ethnic, and linguistic divides. An unintended consequence of Barack Hussein Obama’s support for terrorist groups during the Arab Spring, such as the Muslim Brotherhood, and the terrorist regime in Iran, is an opportunity for stable allies to force a redrawing of the map. While a lasting peace remains elusive, it is not altogether unrealistic to expect that one outcome of this turmoil may be the Arab recognition at large of Israel, and the isolation/trimming down to size of Iran and its wide support of international terrorism.